I remember a meal in New York City, around 2006. The restaurant was BABBO, and chef Mario Batali had made news by putting humble braised short ribs on his menu. 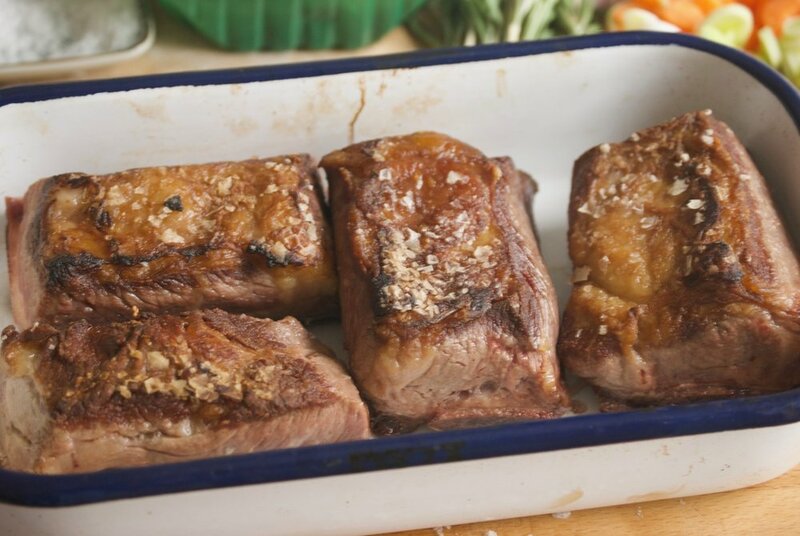 The braise made for a prominent mention in the New York Times, and soon this cut of meat was appearing on lots of menus. I went to BABBO and shared Radicchio, Cacio e Pepe, and the short rib. I have never forgotten it. 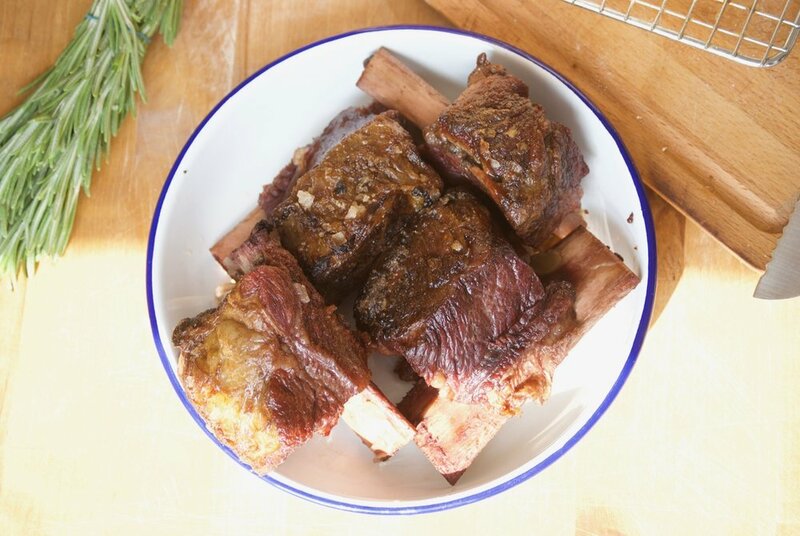 I have made short ribs in the past, and found the results underwhelming. They turned out greasy, lacked flavor and didn't seem worth the time or fuss. 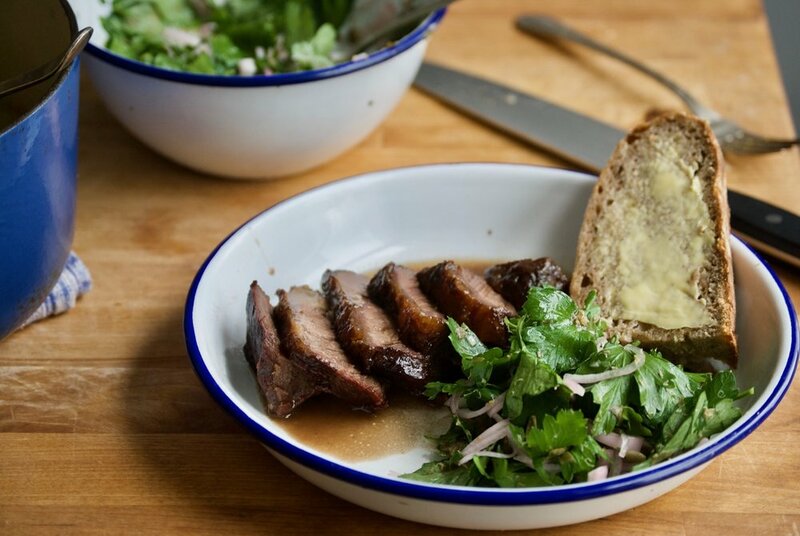 I continued to eat incredible short ribs at various restaurants, including Foxlow in Clerkenwell, so surmised that the fault was probably mine. Thomas Keller's cookbook Ad Hoc at home is squarely aimed at cooks who are looking to up their understanding of cooking technique, and I could easily say that it is one of the books that has shown me easy and straightforward ways to improve how I approach certain foods. 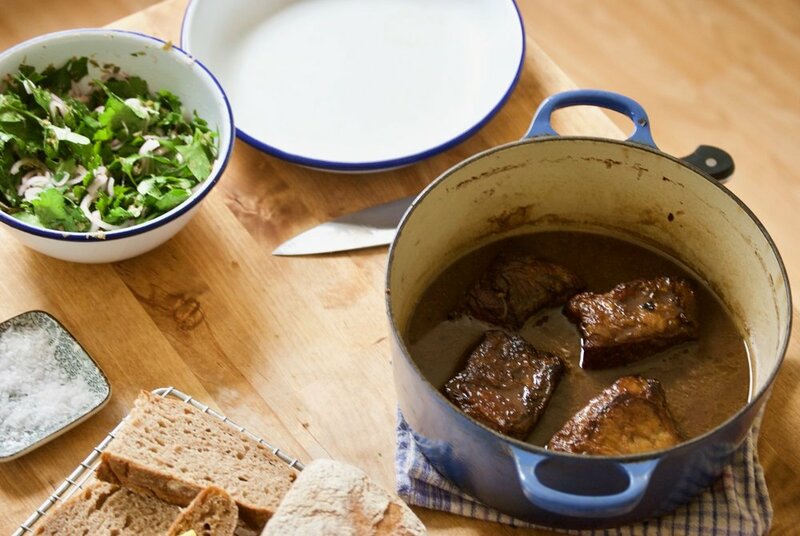 A braise is not complicated, it has a few steps up front, and then cooks for a long while. 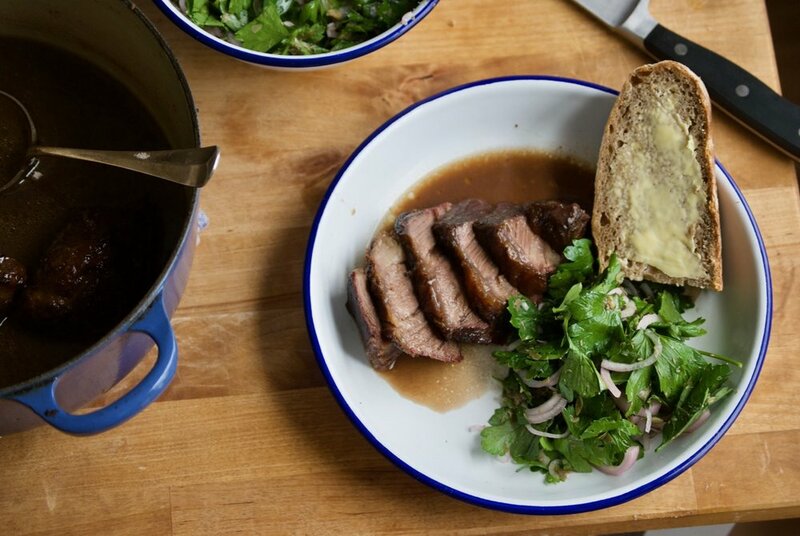 Keller's book's goal is to elevate a home-cook's technique to turn something that is normally just good, into something incredible. This recipe employs a few things that were outside my normal experience. It starts with a reduction of of a whole bottle of red wine with aromatic vegetables. When it comes time to cook the ribs, Keller recommends a cheesecloth nest for the ribs and a parchment lid, which allows for the top of the rib to remain golden and crispy and also lets the liquid evaporate a bit more and concentrate the flavors. I now make it a habit to stock cheesecloth and parchment paper in my kitchen and find them useful for wrapping food, straining stock, squeezing out liquid, baking, etc. I made these ribs for a few friends and was astonished at how well they turned out. Our party was three, and we split the fourth one between us. We were all very sad that I hadn't made another batch. This is definitely a special occasion meal, perfect for a winter afternoon when hanging out in the kitchen drinking red wine from 2pm on seems like the best idea in the world. Lay the parchment paper on the counter and put the Le Creuset top down on the paper and draw a circle. Cut the circle out and snip a small cut in the center. Pre-heat the oven to 325F, 180C. Place the Le Creuset on the stove-top and add the 2/3rds of the carrots, leeks, onion, shallots, mushrooms and garlic, with 2 stalks of rosemary and 1/2 the bunch of parsley. Pour in the entire bottle of red wine, add a good pinch of sea salt and the peppercorns. Bring to a boil, and then simmer for a long enough time to let the wine reduce by half. Strain the red wine through a fine sieve into a bowl and set aside. Wipe the Le Creuset dry. Trim the white skin off the underside of the ribs, and slice away a bit of the fat off the top. Sprinkle both sides of the ribs generously with salt and pepper. Heat up 2 tablespoons of veggie oil in the Le Creuset until it is smoking. 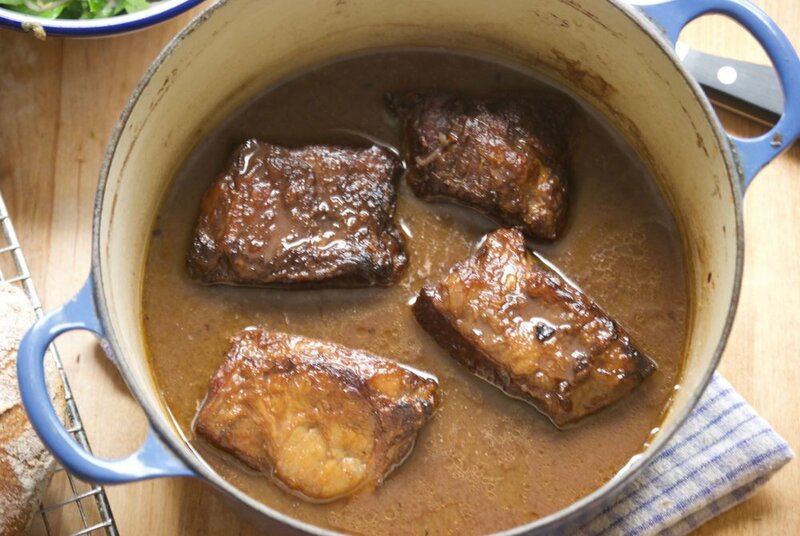 In batches, brown the short ribs fat side down for 4-5 minutes and then flip. Remove the ribs and place on a plate. Pour off the excess fat from the Le Creuset. Add the remaining uncooked vegetables and pour in the red wine reduction. Lay the cheesecloth over the top of the pan, and then fold the edges into the pan so that the cheesecloth looks like a nest. Nestle the ribs into the nest, and pour the broth over them, so that it just about comes to the top of the rib, but leaves the golden bit uncovered. Cover with the parchment lid and slide into the oven. 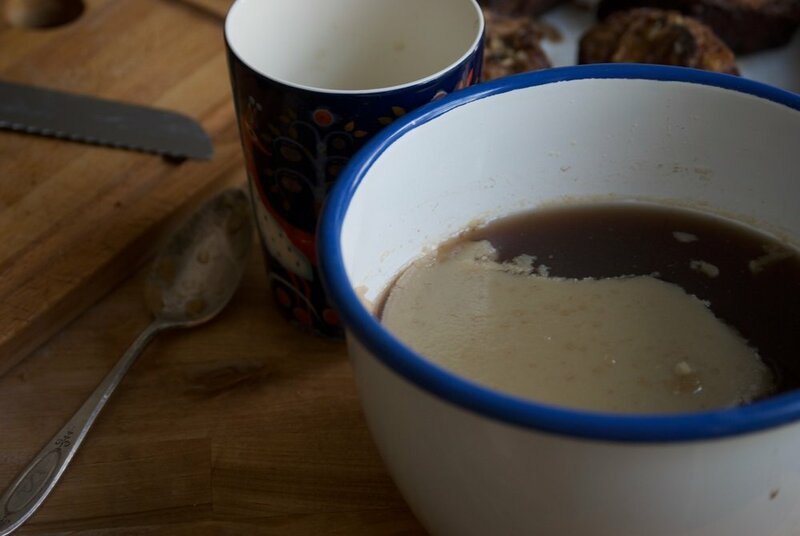 Strain the liquid the pan into a bowl and also place into the fridge until the fat on top as solidified. Scrape the fat off with a spoon. Place the liquid into a pan and bring to a bowl and reduce until the sauce has thickened enough to coat the back of a spoon. When you're ready to serve, bring the ribs up to room temp. Heat a glug of veggie oil in a pan, and place the ribs fat side down over low heat. Flip and keep cooking until they are heated through. Bring the sauce to a simmer on the stove-top. Slice the rib against the grain and serve with the sauce. I recommend serving this with something very simple, like St. John's parsley salad.